Library image #3922: "It's wide enough!" Mules need logs to be cut out a minimum of four feet on each side of the centerline of the trail in order to avoid banging their pack boxes. The United States Congress designated the Ansel Adams Wilderness (map) in 1964 and it now has a total of 231,617 acres. All of this wilderness is located in California and is managed by the Forest Service and the National Park Service. The Ansel Adams Wilderness is bordered by the Yosemite Wilderness to the north and the John Muir Wilderness to the southeast. This wilderness was originally established as the Minarets Wilderness in 1964. These "minarets", a jagged ridge of peaks known as the Ritter Range, are considered to be the one of the most spectacular massifs in the Sierra Nevada Mountains. In 1984 the California Wilderness Act enlarged the area and the name was changed to the Ansel Adams Wilderness to honor the landscape photographer. Ansel Adams is known for his photography of Yosemite National Park and the Sierra Nevada, and his wilderness advocacy work with the Sierra Club. His photography communicated the beauty of wild places and helped develop public support for protecting wilderness across the country. The Ansel Adams Wilderness is contiguous with Yosemite National Park to its north, and the John Muir Wilderness to its south. Elevations range from 3,500 feet along its western boundary to 13,157 feet at the summit of Mt. Ritter. The wide range of elevations and location on both the east and west sides of the Sierra Nevada contribute to the tremendous ecosystem diversity in this wilderness. Roughly 37 inches of precipitation falls annually and in the summer, average temperatures range from 57-89 degrees and 28-47 degrees in the winter. The higher elevations along the Sierra Crest are in glaciated terrain that is dotted with lakes and alpine meadows, and the Ritter Range contains several active glaciers. From the Ritter Range, the North and Middle Forks of the San Joaquin River combine to form the San Joaquin River, which has carved a deep canyon through the southwest portion of the wilderness. There are 349 miles of trail in this wilderness, including a portion of the John Muir Trail/Pacific Crest Trail, which are enjoyed by day hikers, overnight hikers, and pack stock users. Some of the trails provide access to the wilderness in adjacent Yosemite National Park. Portions of the wilderness, particularly the Thousand Island Lake area and the Pacific Crest Trail, experience high numbers of overnight visitors. The areas around the Devil's Postpile National Monument are popular day hiking destinations. Overnight use is controlled by a trailhead quota system that limits the amount of users entering each day from May thru October. 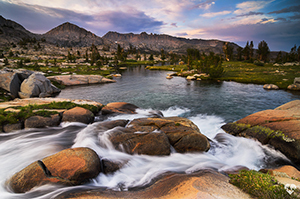 Planning to Visit the Ansel Adams Wilderness? How to follow the seven standard Leave No Trace principles differs in different parts of the country (desert vs. Rocky Mountains). Click on any of the principles listed below to learn more about how they apply in the Ansel Adams Wilderness.